"…it's really terrific, and I know that first hand. That's why I always will be traveling around, all over the world, talking highly about the profession of chiropractic. You chiropractic doctors are really miracle workers, and that's why it's really great to have you here, part of the Arnold Classic. Because, like I said, the Arnold Classic and Fitness Weekend are about health and about fitness and preventive care." Mr. Olympia and Movie Super Star. Appearing in films like The Patriot and Braveheart has taken its toll on Mel Gibson. "You get hurt all the time. All you gotta do is just like eight takes of running down a hill and you twist an ankle," the action pic veteran tells TV Guide Online. "I got a chiropractor to come along to the [Patriot] shoot, because they can actually stick you back together within 15 minutes. He used to come every other week, from Los Angeles to South Carolina - spend a week and work on the entire crew. All the stunt guys were like, 'Oh, fix my disc.' He's putting their discs back in. The guy's amazing." Jeff Spencer, D.C. has been working with Lance Armstrong since January of 1999, helping him to keep his body together for the harsh demands of the Tour de France. After last year's Tour de France, Lance said that he could not have won without Jeff's help. Joe Montana, One of the most recognizable celebrity/athletes, holder of four Superbowl rings, three Superbowl MVP's and Player of the Year in 1990 has just agreed to become the spoke person for Chiropractic in the State of California. Other Famous Celebrities and Athletes Under Chiropractic Care: These famous people all have the ability to choose any health care in the world, but they have unanimously chosen chiropractic for it's health and life enhancing capabilities! Dixie Carter - "I have a wonderful chiropractor. I believe a healthy spine is a healthy body." Andy Griffith - "Chiropractic has advanced tremendously over the past few decades. It has grown by leaps and bounds to become a specialized and accepted science." Katherine Kelly Lang, Bold & Beautiful Soap Opera Star - "I leave my chiropractor's office feeling fresh and rejuvenated and back in line the way I should be. He has also been successful at getting rid of my tension headaches." Lou Waters, CNN Today - "I like to go to the chiropractor at least once a week and have for the past 20-25 years. I feel better when I go; I have more energy." John Robbins, Author of Pulitzer prize-nominated international best seller, "Diet For A New America" - "Chiropractic works in harmony with the basic healing forces of the body, whereas the allopathic, western medical establishment doesn't have nearly as holistic a vision." Fitness Expert - Dr. Joyce Verdel - "Chiropractic helps athletes and people working out, engaging in a sport or even just performing daily functions such as walking and sitting, to operate at their peak levels of performance without pain. I highly recommend that you pay a visit to your local chiropractor." Mindy Mylrea, World Champion - "We put a great deal of stress on our bodies, so chiropractic is very helpful." Bernard Horn, Men's Champion - "My chiropractor is really phenomenal. I've gotten stronger and greatly increased my flexibility." Jose Canseco - "I've found that it's a great stress reliever to get adjusted. It takes away a lot of the tightness in the muscles"
Wade Boggs - "Last year I found Dr. Newman (chiropractor), and I have been seeing him ever since. I have been pain-free and feeling terrific. I swear by it. Now, it is just maintenance and keeping in line so the nerves don't touch." Ryan Sandberg - His wife Cindy explained, "He's had some awesome games after getting an adjustment. He was frequently adjusted before games." Dan Schayes - "I use chiropractic as my main source of healthcare." Gerald Wilkins - "I didn't know how much I could improve until I started seeing a chiropractor. 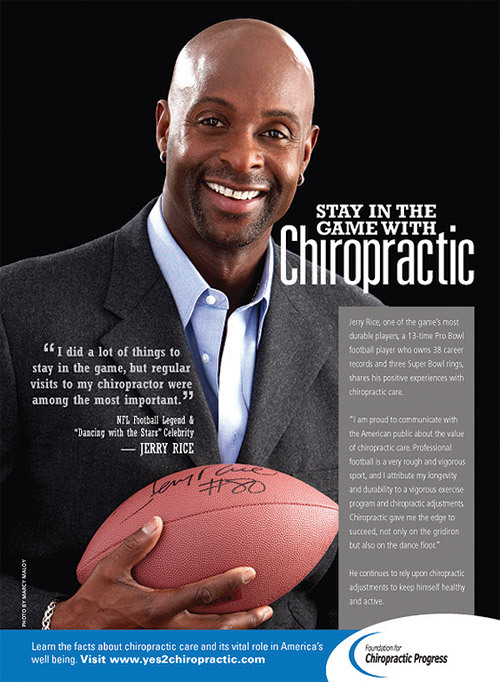 Since I've been in chiropractic, I've improved by leaps and bounds, both mentally and physically." Irving Fryar - I definitely believe that chiropractic care has attributed to my fitness. I don't think I could maintain my level of play without chiropractic. When I go to Dr. Napoli for an adjustment I immediately feel better." Crawford Kerr - "Dr. Bill (chiropractor) kept me on the field many times." Fred Funk, PGA Tour Professional - "I do believe chiropractic has really benefited my game. Over the last three years, I feel I have become more exposed to, and knowledgeable about, the benefits of chiropractic for me and my game. I realize how your body can get out of balance, and chiropractic care helps....."
Barbara Bunkowsky, LPGA Tour Professional - "I have found that chiropractic keeps me flexible and pain-free so that I can perform at my highest level. The benefits of chiropractic have improved my golf swing, putting less stress and strain on my body and allowing me to be a more productive golfer. I believe it also helps prevent other associated injuries that are very common on the LPGA tour." George Angat Jr., US Lightweight Champion - "The split second that can be added to my speed by my chiropractor could be crucial." Manager-Denis Doucette - "Chiropractic care gives him that little advantage, that little extra strength and quickness and allows him his best opportunity to regain his title." Dan O'Brien, Decathlon - "You obviously can't compete at your fullest if you're not in alignment. And your body can't heal if your back is not in alignment. It was the holistic idea that I liked about chiropractic and tat is what track and field is about. Every track and field athlete that that I have ever met has seen a chiropractor at one time or another. In track and field, it is absolutely essential. Chiropractic care is one of the things I think that no one has denied or refuted." Joe Greene, Long Jump - "I know chiropractic helped me. It helped my performance and I feel better."